Q. 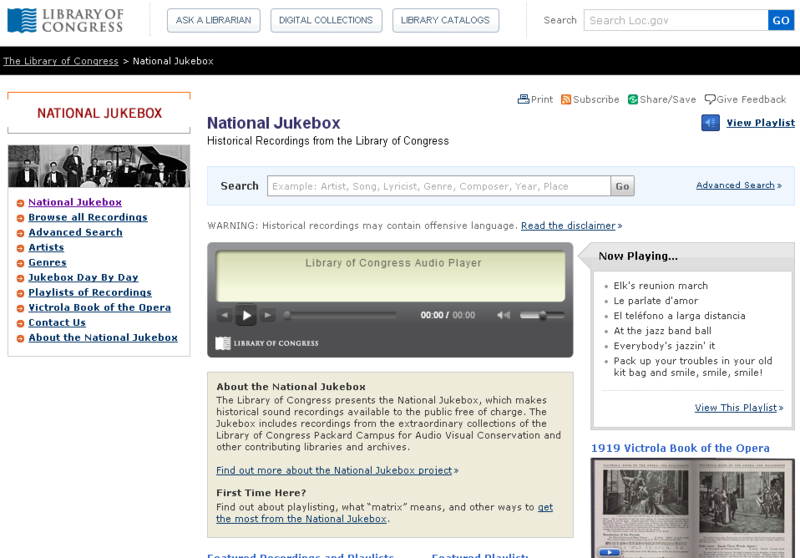 Cool resource: Historical Recordings via Library of Congress "National Jukebox"
"The Library of Congress presents the National Jukebox, which makes historical sound recordings available to the public free of charge. The Jukebox includes recordings from the extraordinary collections of the Library of Congress Packard Campus for Audio Visual Conservation and other contributing libraries and archives." "At launch, the Jukebox includes more than 10,000 recordings made by the Victor Talking Machine Company between 1901 and 1925. Jukebox content will be increased regularly, with additional Victor recordings and acoustically recorded titles made by other Sony-owned U.S. labels, including Columbia, OKeh, and others." --from the Library of Congress website. Genres include Classical Music (including Operas), Ethnic Characterizations, Popular Music, Religous, and Spoken Word. Some of the Spoken Word entries include speeches by Theodore Roosevelt, William Jennings Bryan, and William Howard Taft, as well as a few speech performances, such as the Gettysburg Address. Some of the Popular Music entries are Jazz, Ragtime, Whistling, and Yodeling. As you try to unwind from the deadlines of schoolwork, term papers, and/or tests, take a free trip to past entertainment with the invaluable National Jukebox! And remember, no whistling or yodeling in the library!